Saturday was such a fun day! After living here for almost 2 years (I know, crazy huh?!) we finally got to see our friend Gemma. Gemma renewed our wedding vows here in 2016. 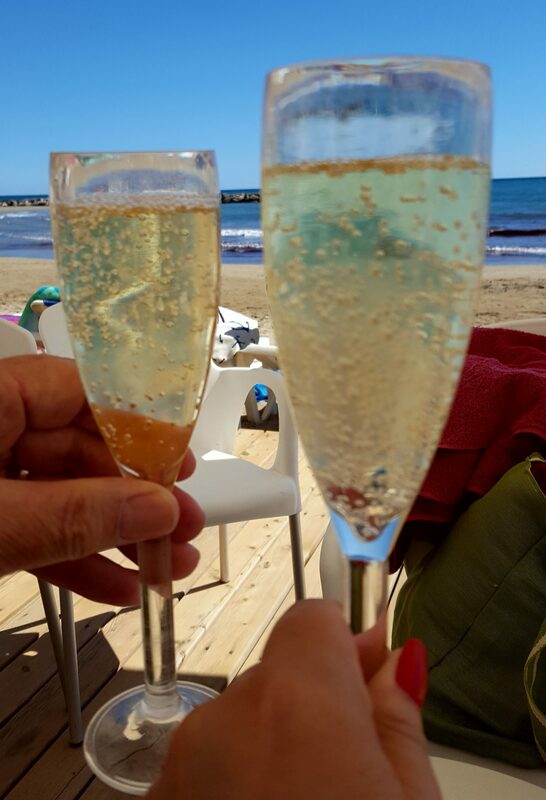 I told you about Gemma in my very first blog post, We have arrived in Spain. If it wasn’t for Gemma our dream would have come to an end. Here is an excerpt from that post. You see, our dream was saved by Gemma and her connection at La Caixa. So, thank you once again, Gemma. Back to Saturday. Gemma and her family live on the other side of Barcelona so about an hour from us. Life is busy and we just haven’t had a chance to see each other since we moved here. They arrived at 10:30 a.m. and we showed them around our home. It was the first time we had met her husband Jordi and her kids Ferran and Laia. Such a lovely family. We had booked a winery tour here at 11 a.m. Hanna had told me that there was another couple that had booked the tour so it would be given in Spanish. This was good for Bob and me as we have been on the tour so many times with Hanna that it helped us with learning the language more. Hanna is such a great tour guide. She knows about the vineyard, the wine and the history of the area. All told with passion and in a way that people learn and feel comfortable asking questions. The tour included the vineyard, the 13th-century church, the museum, the winery and then wine tasting. Unfortunately, we had to skip the tasting as we had lunch reservations at 1:30 p.m.
Hanna sharing her vast knowledge with us. Ferran peeking in on the skeleton in the jail. Checking out the 1000-year-old tower. Even the kids were curious. As we left the museum on our way to the winery, Marcelo the owner of Viladellops stopped and chatted with us. We took them to Les Piques in Olivella and Joan was an incredible host as always. Here he is showing them the oven and hot stones. We had such a wonderful time catching up and telling them about our new life here in their beautiful country. We told them about our crazy adventures when we first arrived, about the amazing neighbors who have become dear friends, about my writers’ group and our book and about the other great friends we now have here. We loved hearing about their lives and getting to know the family. Everyone loved lunch but perhaps Laia enjoyed her lunch more than any of us. I just love these photos. We made plans to visit them in their town in April for the Festa del Pèsol (the pea festival). It will be great to see another part of this beautiful place. It was such a fun day but went by too quickly. Oh, and because we missed the wine tasting we made sure to get a bottle of Finca Viladellops wine at lunch.